U.S. Women's National Team Reaches New Labor Deal With U.S. Soccer : The Two-Way The players' union and U.S. Soccer announced the collective bargaining agreement Wednesday, ending protracted and sometimes bitter negotiations over wages. The deal runs through 2021. 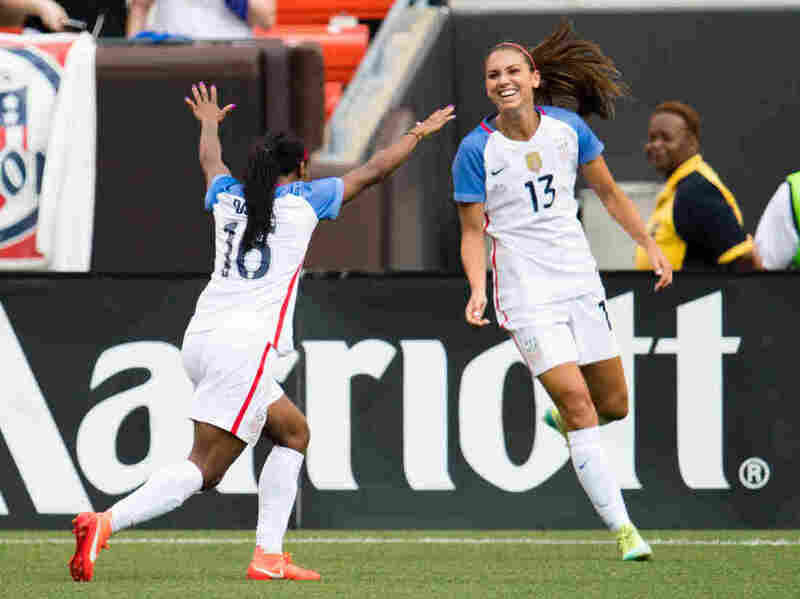 Crystal Dunn (left) celebrates with Alex Morgan after Morgan scored during a friendly match against Japan last year. The World Cup champion team and the U.S. Soccer Federation have settled on a wage deal, ratifying a contract that runs through 2021. The U.S. women's national soccer team has agreed to terms on a new collective bargaining agreement with U.S. Soccer, concluding a protracted dispute over their union contract. The deal will "continue to build the women's program in the U.S., grow the game of soccer worldwide, and improve the professional lives of players on and off the field," the federation and the players association announced in a joint statement. U.S. Soccer and the USWNT Players Association ratify collective bargaining agreement through 2021. The collective bargaining agreement announced Wednesday runs through 2021, meaning that the union has committed to playing under the contract for the 2019 World Cup in France and the 2020 Tokyo Summer Olympics. Neither the union nor U.S. Soccer has released the specific terms of the agreement, though The Associated Press reports the players will get better base pay, bonuses and travel provisions, as well as "some control of certain licensing and marketing rights." The New York Times places the boost to base pay at 30 percent, which when coupled with match bonuses could double some of the players' incomes, according to the newspaper. "We believe our continued partnership will ensure a bright future for our sport for years to come," U.S. Soccer President Sunil Gulati said in a statement. For a while, that partnership appeared in danger of running aground. As NPR's Bill Chappell reported, the players' previous CBA expired at the end of 2012, though it was extended by a memorandum of understanding while contract negotiations unfolded. But those talks were far from smooth, as players resorted to the courts to open the possibility of going on strike to protest a lack of progress at the negotiating table. U.S. District Judge Sharon Johnson Coleman ruled against them last year. The new deal represents a marked improvement in players' financial terms, though the Times reports it falls short of complete pay equity with the men's national team, a sticking point in both these negotiations and a separate complaint filed last year by five star players for the women's team. The latter wage-discrimination complaint is ongoing. In the meantime, soccer officials and players alike cast the new CBA as a sign of progress to be celebrated. "It felt very empowering," national team player Alex Morgan told the AP. "Because there is a whole issue going on in the country as far as equal pay and the fight for the gender pay gap. And I felt really happy with the agreement that we reached and the fact that we can now do what we came for and play soccer."